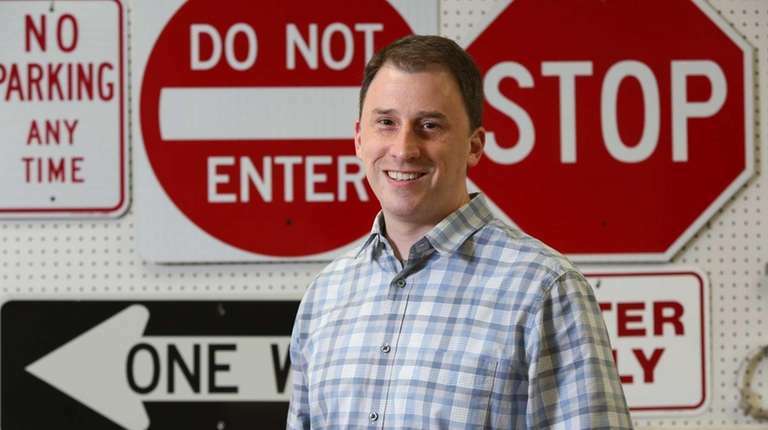 Mark Fick, 38, left a job in Manhattan a dozen years ago to come home and get his family's Deer Park sign business online. He had learned Web skills while working at Ogilvy & Mather, the marketing company. Fick spent about a year posting 3,000 Allstate Sign & Plaque products to the new website. Now the once-tiny engraving business, launched in a basement by his German grandfather, Rudy Wolff, in 1956, does 40 percent of its business online and ships orders across the country and to Iraq and Afghanistan. It fulfills contracts for governments, schools and private companies. Fick says he still asks his grandfather, now 85, for advice on occasion. How does your online business work? Anyone can order any of our stock signs, or we have a little sign configurator-type thing on our website where you pick your size, type in your wording, pick your colors and submit the order. We lay it out and email you a proof. If everything is good, we print it and ship it out. What are the biggest sellers? No Parking or Handicapped Parking. Any tips on sign design? Use the fewest words so that they can be as large as possible. Legibility is a big issue. Once you're 10 feet away, it becomes unreadable very quickly. Nobody wants to read a paragraph about where they can and cannot park. What's the worst color for a sign? Red is probably the worst because the pigment fades in about five years. If you're going to order a sign for your parking lot, choose black. You get more for your money. How did the digital revolution change things for you? You hate to see fewer humans needed, but obviously there's a cost and time efficiency. Fifteen or 20 years ago in our custom signs department they probably had up to six people working, because you used to have to actually cut out a lot of things by hand, literally placing letters and lining them up on a ruler and sticking them onto the signs. Now it's just two people with large-format printers and smaller printers who are able to lay out the design on the computer, print out a beautiful vinyl sign face, and then that gets peeled off and applied and run through a roller onto an aluminum blank. So it's a matter of a few minutes, and you have a custom sign, whereas it could have taken maybe an hour previously. What's your advice on staying in business for 55 years? The key to surviving is being able to adapt. Had we just stayed as a very old-fashioned company that was writing things down by pen and paper and not getting on the Internet, I'm sure we would have been sunk a long time ago. Why are you running a school contest for anti-bullying signs?